Alexander Stephens, who was born in Crawfordville, Taliaferro County, Georgia, was inaugurated as Vice President of the Confederate States of America on February 18, 1861. Stephens graduated from Franklin College, later known as the University of Georgia, and served in the Georgia legislature. Stephens opposed Georgia’s secession. One year later, Georgia’s delegation to the Confederate Congress, numbering ten members, was sworn in. Ina Dillard was born on February 18, 1868 in Oglethorpe County Georgia. She married Richard Russell, who served on the Georgia Court of Appeals and as Chief Justice of the Georgia Supreme Court. Their son, Richard B. Russell, Jr., would be elected to the Georgia House of Representatives, where he served as Speaker and became the youngest Governor of Georgia in the 20th Century. In 1932 he ran for United States Senate and was elected. In 1936, Russell was elected to his first full term in the Senate over former Governor Eugene Talmadge. In 1952, Russell ran for the Democratic nomination for President and he was an early mentor for Lyndon B. Johnson, who later served as President. Russell served on the Warren Commission that investigated the assassination of President Kennedy. Russell served as Chairman of the Senate Armed Services Committee for many years. Russell was an acknowledged leader within the Senate, and especially among Southern members, and he led much of the opposition to civil rights legislation and the Civil Rights Act of 1964. The Sons of Confederate Veterans issued a press release about the new “Southern Heritage” car tag that is now available from the Georgia Department of Motor Vehicles. 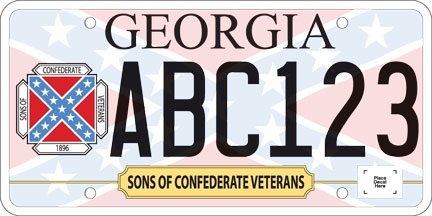 As of February 1, 2014, the Sons of Confederate Veterans have a totally new Special License Plate available to all Georgians. The new design has already been approved and is now available as part of the state’s new format which allows for digital images for license plates instead of the traditional raised letter format. The new design of the SCV’s special license plate features a much more prominent logo of the organization with larger stars and a beautiful Confederate battle flag image in the background and covering the entire size of the plate. Additionally, the plate features a gold frame with the words “Sons of Confederate Veterans” displayed where the county name was previously featured on the plates. I neither endorse nor oppose these license plates, noting only that the issue of the Confederate flag is complicated. The only specialty tag you’ll ever find on any car of mine is the Historical Vehicle tag. Senate Bill 93 will be heard in Natural Resources today and would allow the use of suppressors (“silencers”) on hunting rifles in some circumstances. Senate Bill 343 will be heard in the Senate Education Committee and would amend the QBE Act to require athletic associations sponsoring interscholastic sports to meet certain criteria. Senate Bill 166 if passed in its current form would close the auto sales exemption under which Tesla sells a limited number of electric cars directly to Georgia consumers. Similar legislation is under debate in Ohio and Washington State. The Joint House and Senate Ethics Committee has nothing to do with medical marijuana. Instead, it will be an open forum for Questions and Answers regarding ethics legislation passed in 2013. The following bills are eligible for consideration on the floor of the Senate today. SB 95 Elections; counties utilize a chief executive officer/county commission form of government; nonpartisan elections (As Introduced) (ETHICS-40th). SB 336 Cosmetologists; provide fines imposed by State Board of Cosmetology for certain violations; not exceed certain specified amounts (As Introduced) (RI&U-3rd). SB 337 Barbers; provide fines imposed by State Board of Barbers for certain violations; not exceed certain specified amounts (As Introduced) (RI&U-3rd). SB 346 Board of Community Health; at least one member also member of the state health benefit plan (As Introduced) (H&HS-29th). SB 349 Behavorial Health and Developmental, Dept. of; changes to the powers and duties (As Introduced) (Substitute) (H&HS-54th). SB 350 Human Services, Dept.of; bidding out of child welfare services state wide through contracts with community based providers (As Introduced) (Substitute) (H&HS-45th). 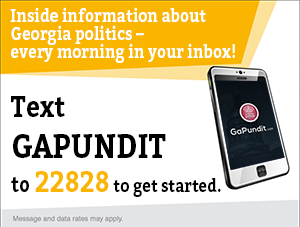 Here is the Georgia Public Policy Foundation’s synopsis of an earlier version of SB 350. This was the first hearing for SB 350 that would reorganize Georgia’s approach to foster care. The Division of Family and Children Services would focus on investigations but would no longer care for about half of 7,000 youth in foster care. Those youth would transition to private care providers. The change would begin in July, 2015 with implementation over two years. Here is some discussion of SB 350 by former foster care youth in the Senate Committee. Senators William Ligon and Renee Unterman each will be presenting two bills on the floor today. Here is some information on how Raccoon Field Trials are conducted in North Carolina. And a dissenting view from a raccoon hunter who disapproves of the American Kennel Club. Obviously, there are concerns about the humane treatment of the raccoons. It’s a complex issue, and I’m not sure what I think about it. I own a coonhound, and that dog clearly wants to chase stuff up trees. And I recognize that raccoon hunting is part of our American heritage. Is this kind of field trial less humane than actual raccoon hunting? House Bill 863 by State Rep. Rich Golick (R-Smyrna) would revise Georgia law on cruelty to animals. Among the added elements are adequate shelter, food, care, ventilation, water, veterinary care, etc. (2) Having care and control of an animal, willfully, wantonly, or recklessly fails to provide adequate care to such animal. Subsequent convictions may be a “high and aggravated“ misdemeanor. Malicious acts toward animals that would otherwise fall under the criteria for animal cruelty may be charged as a felony of aggravated cruelty to animals and punished by up to ten years in jail. This is great legislation that I have no hesitation to support. One issue it may run into is with hunters groups concerning issues such as the aforementioned Raccoon Field Trials. While there is language in Golick’s bill stating that it does not forbid otherwise legal hunting and other activities, I suspect there may be some word-smithing and fine-tuning involved in the process. Landmark Communications released poll results on a question related to this bill. A recent public opinion survey by Atlanta Landmark Communications reveals that voters in the State of Georgia are ready to implement harsher penalties for animal cruelty. 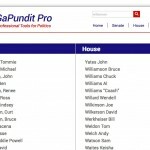 The survey, which was conducted on January 23, 2014 and sampled 750 random likely general election voters – shows little opposition to this bill from any demographic or political affiliation. Male voters in our sample favor this measure by a margin of 64-15 while female voters in our sample favor the measure by a margin of 63-15. Self-identified Republican Primary voters were the strongest supporters of the measure by a margin of 72-13 ­ while Democratic voters favored the measure by a more modest margin of 55-19. The sponsor of this legislation is Smyrna Representative, Rich Golick, who is expected to hold meetings this week to hear input from the public. Golick currently serves as Chairman of the House Non-Civil Judiciary Committee. I’ve known Rich Golick for many years and consider him a friend, and a very able legislator and fair Chairman. Those who oppose legislation in his Committee, even when it’s sponsored by him, can be assured of being treated fairly and with respect, and that their concerns will be taken into account. I can think of no higher praise for a legislator than that. Republican Senate candidate David Perdue sat for a wide-ranging interview with the Marietta Daily Journal. It’s a valid question whether he did himself more harm than good. These extended interviews are part of the reason I consider the Marietta Daily Journal highly enough that I personally pay for their online subscription. Perdue said he’s spoken at length with his cousin, the former governor who was involved on the front end of helping to launch the Common Core Standards. For the most part, he said the two are in agreement on the controversial topic. “The original intent, I agree with that. 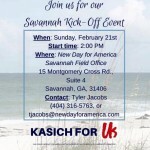 It’s where it gets into the details, into the weeds of how it’s going to be administered, that’s where I have a problem with that,” the senate candidate said. Perdue points out that Common Core is not a curriculum, but a set of standards. In other words, he said he shares [State Rep. Sharon] Cooper’s position that he’s pro-life, but there needs to be certain caveats. “Well, I think so. This is not a black and white issue. We need to protect innocent life, but there are situations where I think common sense needs to play,” he said. 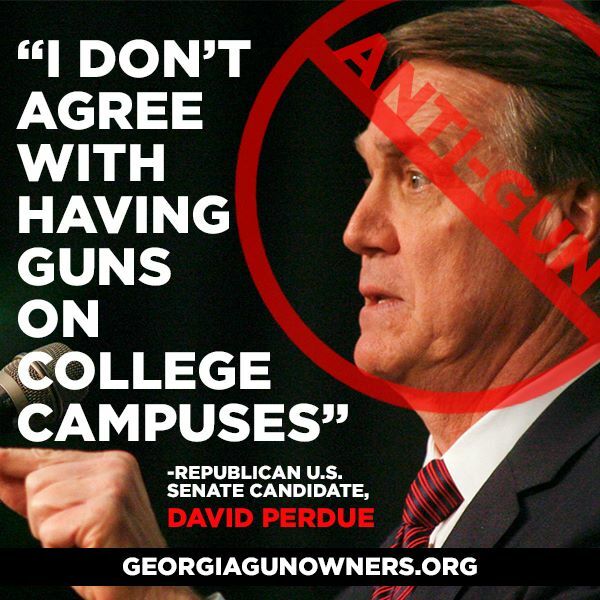 Georgia Republican Senate candidate David Perdue stepped in it this weekend, saying he was supportive of campus gun free zones. We know a squish anti-gunner when we hear them talk . . . and David Perdue is one of them. Note that last graph is a quote from Georgia Gun Owners.